Come back to a night in June 1973, in New Orleans. The gay community often met up at the Upstairs Lounge in the Vieux Carré . But those were days when there was a lot of anti-gay activity in NOLA, and the local police were quite corrupt. And when the building went down as a result of arson, they never determined who had done it, nor how. But, there’s a saying that the more things change, the more they stay the same. It was just 2 years ago that a gay club in Orlando was attacked. And just this past week, some creep shot up a dozen people in California, less than 10 days after the attack on a synagogue in Pittsburgh; and there are sooooo many more. It has also been stated that those who do not remember the past are condemned to repeat it. That was George Santayana in 1896. Well, that’s life; but is it the life we want and need? 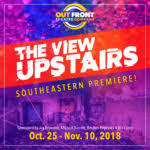 It was extremely timely that Out Front chose to stage this southeastern premiere here and now. The show is done as a musical. Books, music and lyrics by Max Vernon and directed by Paul Conroy. Nick Silvestri handles the music and a cast of ten players pour their hearts and souls into the story of Wes (Kyle Larkins), a fashion designer who gets involved in the club and himself when he acquires the building after the fire. The time gets a bit askew as the fire is in 1973 and a lot of the action is present day. But, therein lies the story. If only we could all recall that we are all human and entitled to the same love, respect and support; regardless of color, faith, sexual orientation, or other attributions. Thank you Paul, for bringing this to us at this time.